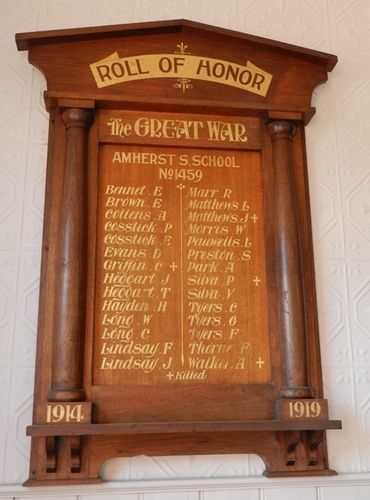 The Honour Roll commemorates former students of Amherst State School who served in World War One. Mr G. Frost, M.L.A., Mr S. S. B. Gill, B.A. (district inspector), And Mr J.La Gerche, B.A. (principal Maryborough Technical visited Amherst to take part in the ceremony of the unveiling of the honor roll of 28 former) scholars of State School No. 1459 who enlisted for active service in the Great War, 1914-19. The visitors were met at the school by Cr W. E. Gane (chairman) and Mr Whitworth (correspondent), members of the school committee, and Mr M. M'Phee (head teacher). Proceedings opened with the National Anthem, after which Cr Gane said that although the school committee lost no time in placing the order in Maryborough for the honor board, it was not the committee’s fault that it was so long in coming to hand. At last they had got it, and when they saw it he (the speaker) felt that they would say it was a credit to Amherst. Most of the young men whose names appeared on the board had grown up in the school, or, through their parents having to leave Amherst to seek employment elsewhere, had completed their schooling at other schools. Ballarat Star (Vic. ), 27 December 1921.